Today I am welcoming the gorgeous Sarah Groom from Homemade, Healthy, Happy to the blog. She is sharing with us her fabulous Nourishing Nuggets recipe. Sarah cooks allergy-friendly, wholefoods in her thermomix. Check out her blog and Facebook page. I have followed Sonia’s Just Say No to Nuggets campaign with great interest. Chicken nuggets are such a staple in the kitchens of so many families, and the diets of so many children. But sadly, they can often be loaded with more bad than good. 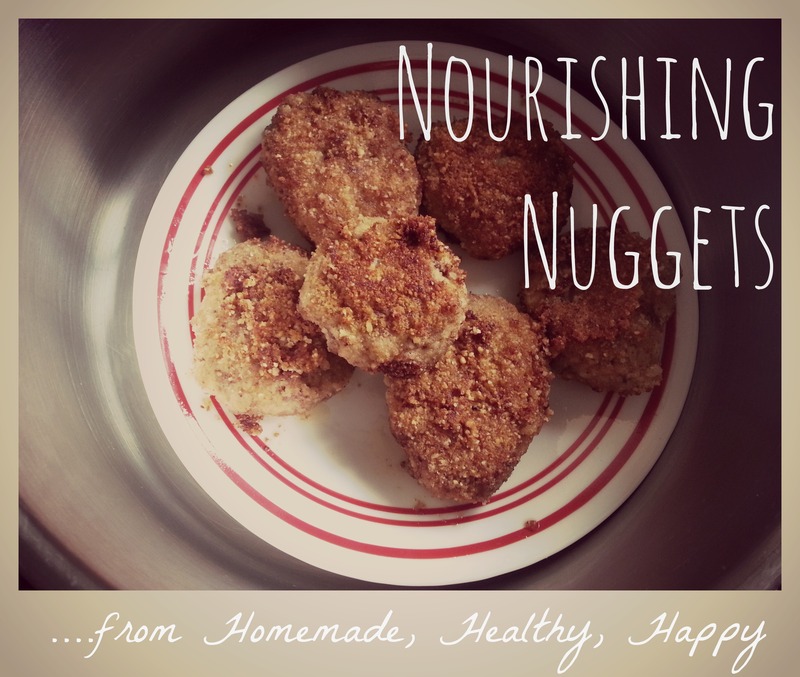 So, in the interest of swinging the balance back towards the good, I made it my mission to come up with a tasty nugget recipe that packs a huge nutritional punch by incorporating a food that is so sadly overlooked in so many houses. This food has fantastic doses of minerals and vitamins, including iron and A, B, D and K vitamins. But many people (children especially) are not so keen on the strong flavour of this food, which is why I choose to use it in small amounts – but you can build up the amount quite easily with repeated exposure. Yes, we are talking organ meats. Liver, to be precise. I find that the easiest way to use liver is to freeze it in a big block and cut off sections each time you need it. Liver softens quite quickly out of the freezer, so it is not too hard to just slice a bit off and add it to meals. And this doesn’t hold for nuggets only – liver can easily be added into stews, casseroles, pasta sauces…. Let your imagination run wild! And as an added bonus, the crumbing for these nuggets is grain free! 1) Place all crumb ingredients except egg in the TM bowl and process on speed 9 for 8-10 seconds. Set aside. 2) Place chicken liver in TM bowl and turbo 3 or 4 times until finely diced. Scrape down the sides. 3) Add chicken thighs and turbo a further 8-10 times. 4) Shape chicken mix into balls (about 1 Tablespoon of mix per nugget), dunk in the beaten egg, then coat in the crumb mix. 5) Heat oil (about half a centimetre deep) in a frying pan over medium heat, or medium-low heat if you are using a cast iron pan. Let your oil get nice and hot before you put the nuggets in. 6) Fry the nuggets in batches, taking care not to overcrowd the pan. Cook for about 8-10 minutes on each side, or until they are crispy and cooked through. Notes: For those without a thermomix, use your food processor to make the crumb and chicken mince instead of chicken thighs. You might also like to check out some other chicken nugget recipes. Where does one acquire chicken liver? I have seen it just at the supermarket! We’ve been raising our own chickens for eggs and meat and when we become more proficient at harvesting we will be able to make use of the liver. I’d planned to have a go at pate but this is another great use – thanks! And although we don’t buy processed foods (my kids have behavioural issues after eating any of the artificial colours, flavours, preservatives, sugar or any of that stuff) I do mightily miss the convenience of foods like nuggets and the like. A bulk batch of these in the freezer and whammo, healthy convenience food. 😀 Thanks for sharing. thanks for stopping by – it is handy to have a few in the freezer as back up for those crazy days! I’d love to try those and freeze them so they’re on hand when I pack school lunches, they sound delicious. However, my kids’ school and kindy have nut-free policies. Any idea what I can replace the almonds with? Hi Alex – check out the other nuggets recipes – you can use polenta, rice crackers, all sorts of things! Would baking the nuggets work as well as frying? Yes Megan – just give them a drizzle of oil on top to crisp and brown in a hot oven. can you freeze these and reheat?